Steven (Chicagoland, United States) on 16 January 2018 in Architecture and Portfolio. 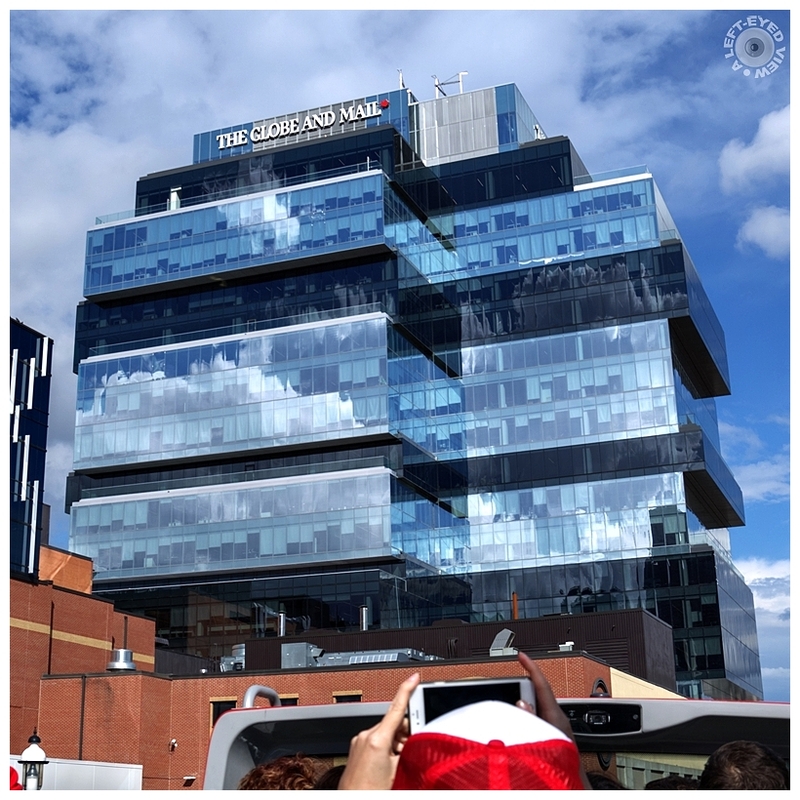 The 500,000 square-foot Globe and Mail Centre is the home of Canada’s national newspaper and anchors the emerging St. Lawrence neighborhood as a hub of urban activity and corporate offices. The tower occupies a block defined by King Street East, Front Street East, Berkeley and Princess Streets, with a public midblock connection between King and Front with retail amenities at grade level. The 17-story building presents a sequential stacking of alternate-sized floor plates interlaid with terraces that give the structure a distinctive and contemporary profile. A high-performance building envelope and advanced glazing system supplies the building with daylighting deep into the core. Ten-foot-high windows offer views to the waterfront and city skyline. Photo captured September 29, 2017 while on a sightseeing tour bus. Wow, I Love this one! Great shot, Steven!! Modern architecture is great looking. A wonderful image of this famous Canadian newspaper. A real institution. J'aime bien les reflets dans les vitres de l'immeuble. Very nice graphics, worth photographing ! Terrific shot and I like the inclusion of the photo taker in the foreground. Interesting information as well. One of the nicer new buildings in the core, and one which reflects the sky nicely as shown in your photo. This is a newspaper established in 1844, making it an old one by Canadian standards. Beautiful play of blue tones and reflection. A great looking building with a unique provsion for day lighting in the interior. Excellent picture. An interesting building, with this cubics structures. That is a distinctive and beautiful building. It has that sort of mechanical look that brings to mind the Lippo Building in Hong Kong. Une belle prise de ville ! I bet it's even more beautiful on a fine cloudless day. What a fabulous building! I love the architecture! Wonderful information. That is quite the building. Terrific shot. somebidy's been playing with their Christmas Leoos.